Jessica Davis is a dynamo. Four years ago she got to thinking about Mary Lou Williams’s Women in Jazz festival at the Kennedy Center. She thought about it and asked herself why Seattle didn’t have something similar. Figuring Washington State can do anything the other Washington can do, only better, she decided to start one all on her own, with or without anyone’s help. Now in its third year, the Seattle Women in Jazz Festival has expanded to have a full jazz walk and more film screenings–even a CD release party — a labor of love for this Valentine’s Day weekend. If you know anything about jazz in Seattle, you probably know that the biggest obstacle to growing our native jazz scene is a lack of opportunities for young musicians to play outside of school. It’s no secret that Seattle-area high schools have dominated the Essentially Ellington competition nationally for the past two decades. It’s also no secret that our University of Washington and Cornish jazz programs are regarded as among the finest. Where the city fails is in bridging the gap from being a student to public performer. The IMPfest has helped over the past few years, but there is a long way to go. To that aim, Ms. Davis has taken it upon her to include many of Seattle’s talented high school musicians in this year’s festival as well, in a 1 pm showcase this Saturday at the Columbia City Church of Hope. Introduced by Mayor Ed Murray, the showcase features a supportive and encouraging environment to celebrate jazz students of all ages and experience levels. And in the spirit of jazz competition, a chosen winner will receive a tuition waiver to a Jazz Night School program and a studio session with Critical Sun Recordings. Beyond that, there is the usual assortment of talented local performers in diverse styles, including Hopscotch, EntreMundos, the Joanne Klein Trio, and even Ms. Davis herself, singing with her own band of Overton Berry and Ronnie Pierce. And don’t miss the all-ages swing band party on Saturday night, which promises to be a true ball. It has been incredible to watch this festival grow through the efforts of one lone woman. Now with some help from her partner Kendra Aguilar, Ms. Davis’s seemingly boundless energy has brought Seattle a redoubled festival and even bigger plans for the future. One can hardly wait to see what she brings next to the city. 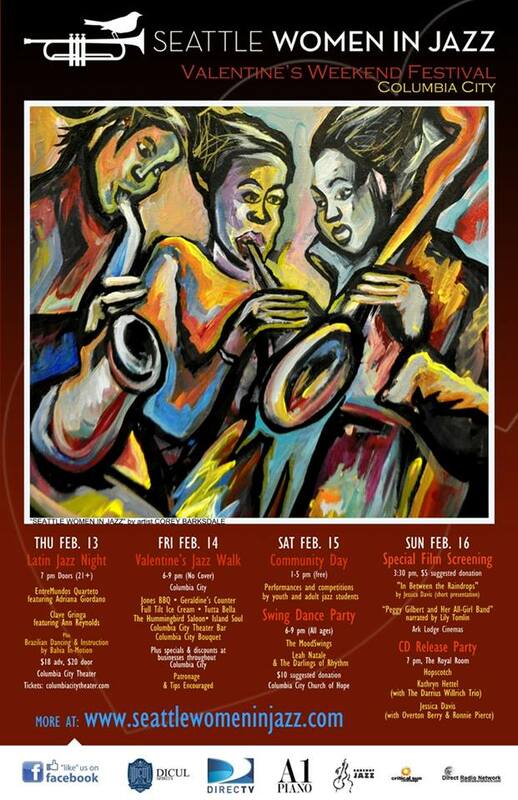 Find the full schedule at http://www.seattlewomeninjazz.com.